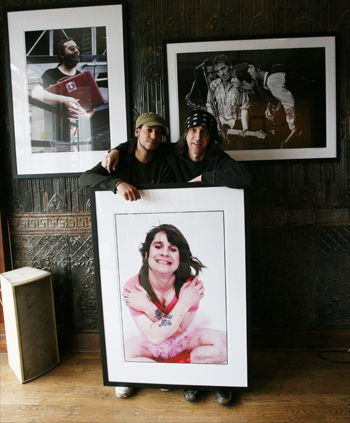 For those unfamiliar with Mark Weiss, he is perhaps Rock n' Roll’s most legendary photographer. You name ‘em, he’s shot ‘em in some form or another. Ozzy Osborne, Bon Jovi, Kiss, Led Zeppelin, Aerosmith, The Rolling Stones, Metallica, Jerry Garcia, Van Halen, Henry Rollins, James Brown, Bruce Springsteen and on and on and on. lt’s a list that is seemingly endless. Mark got his start in the rock world by paying off security guards to get up close at con- certs and sneaking camerasinto shows where he’d shoot from just rows back. Eventually he landed a gig as the staff photographer at Circus Magazine and the rest is, well, rock and roll history.You can see some of his work which is currently on display at Jamian’s Food & Drink, 79 Monmouth Street in Red Bank. Credit goes to Jamian's Art Curator Travis Radcliffe for hooking up with Weiss. The show features some of Weiss' most iconic rock images from the 70's and 80's and will hang through January 5th. Weiss' work can also be seen throughout Jon Bon Jovi’s new book “When We Were Beautiful", currently 15 on the New York Times Best Seller's List.So how does a guy with a resume this deep end up showing his work in Red Bank? lt turns out the coolest part of the story is that Mark Weiss, a Newark native, is a triCity area resident, calling Atlantic Highlands home these days.Check out Weiss’ work on permanent display at Vintage Variety on First Avenue in Atlantic Highlands. For more info on Mark Weiss visit www.weissguygaIlery.com.